Sometimes when things are going badly—as it was for the Bulls Sunday in a national TV 90-81 loss to the Los Angeles Lakers—you have to be thankful for the positives. Oh yeah, no one else got hurt and none of the Bulls many, many missed shots injured any spectators. “I feel like we can still do better defensively,” said Joakim Noah, who had a terrific effort with 18 points, 17 rebounds and three blocks. “And we can definitely do better offensively. It’s just hard sometimes when we’re not used to seeing Lu (Deng with 11 points and eight rebounds) play the four; guys have to play out of position right now. No excuses, though. It’s tough but we just got to bounce back and get a W in Sacramento (Wednesday). We’ve just got to keep fighting. Sometimes we get a little too frustrated. We have to understand that. Well, I don’t know about that as Richard Hamilton remained back in Chicago with back problems as the Bulls finish this week in Sacramento and Golden State. Kirk Hinrich and Taj Gibson were walking better, but still not playing. Derrick Rose, of course, remained out and the latest on the ABC TV broadcast was Rose’s hamstrings bothering him as he works out. Of course, after 10 months of rehab they probably should when you increase your level of activity. So it doesn’t sound like anyone is coming back all that quickly. And as much as everyone continues to maintain the no excuses ethic, it’s difficult to see this Bulls team able to compete against high level opposition with so much offense missing. But it’s more than that as Noah alluded to. And, by the way, Noah was terrific in fighting off Dwight Howard, who seems to be returning to some form with 16 points, 21 rebounds and four blocks. 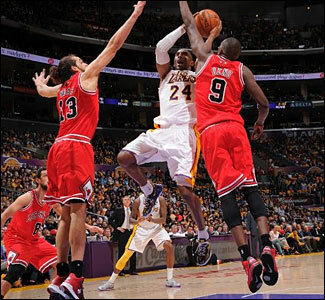 Kobe Bryant had 19 points and nine assists as the Bulls devoted their defense toward him. 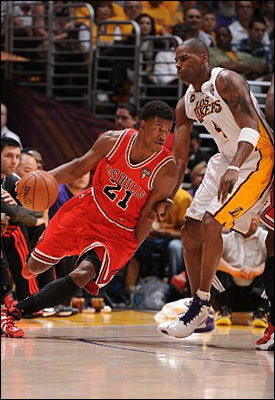 The Lakers moved to 33-31, their best mark of the season, while the Bulls fell to 35-28. You hate when the other guys see you coming as a break in their schedule. The Bulls actually were in the game in the first half, trailing just 44-40, though you felt the end was coming for them any moment. The Lakers seemed in constant control, and after halftime put the game away as the Bulls had the lead in a gruesomely slow and low scoring game for a total of 52 seconds. And it goes back to what Noah was suggesting despite trying to avoid the so called excuses. It’s guys playing positions they often don’t, playing with groups they normally don’t play with, trying to adjust a disciplined system to players who should be specialists and not running a complex offense. 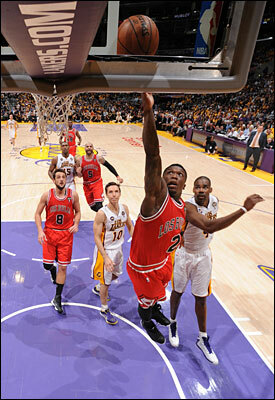 Nate Robinson led the Bulls with 19 points and eight assists. He also had four steals, which is an excellent line. He makes big shots and gives the team energy and missing athletic play. But he also tends to take out Deng and sometimes Marco Belinelli, who play more off the movement in the system. It’s not the fault Robinson because he hasn’t ever hidden who he is as a player. But the game can be a delicate balance, and there are only so many changes a team can absorb on the fly. It may sound like making excuses for the team, but it’s difficult to see how the Bulls, for example, matchup with a team like the Lakers, who barely are in the last playoff spot in the conference. Sure, the Lakers have had disruption, the firing of a coach, the issues with Howard and Bryant and their own rotation gyrations. OK, Noah was strong and good on the boards. But Bryant is playing at an MVP level. So the Bulls devoted their defensive rotations to walling off Bryant. Generally, Deng or Jimmy Butler defended him. The big men inside help and show size coming in his field of vision. It’s an alternative. They could trap Bryant on the pick and roll. But then it’s a longer way to try to get back to help on Howard, whom the Bulls held in check at least on offense much of the game until he got loose for half his points down the stretch when the game basically was decided as the Bulls trailed by double digits most of the fourth quarter. But you still are looking at Howard, Bryant, Nash, Ron Artest, Antawn Jamison off the bench. The Bulls got 12 points and 10 rebounds from Carlos Boozer, but he had to fight off aggressive fronting from Artest that led to four of 16 shooting. Additionally, Deng was five of 16 and Marco Belinelli was five of 15. The Lakers are not exactly a defensive machine, or even a particularly good defensive team. Though as Howard comes back more from back surgery they will get better in the half court with his presence. And the Bulls offense even in good times is slow, using up the shot clock and precise. The precision is missing with so many injuries and players in different positions and rotations, and the Bulls don’t get easy points. The Lakers led in fast breaks six to four in the game. “We just missed some easy shots, some easy tidbits,” explained Robinson. “It happens, but for us our main focus is defense. We have to play our Chicago defense. We’ve been lacking in that the past couple of games. We just need to find it and play. Play every game like last one and we’ll be all right. “We’re just not making our shots,” Robinson added. “We made shots you (media) guys go, ‘Oh, my god.’ We’re in every game; we play hard. Play out our funk and keep having fun. We have the best job in the world so no complaints about any of that. We have to continue to stay humble and cherish every game like it’s our last. Actually, finding the hoop was the problem as the Bulls after hanging in for the first half threw in still another of those sub-30 percent shooting quarters, 29.2 percent in the third as they fell behind 73-61 as Nash got loose while the Lakers had a 12-0 run in the middle of the quarter, one of those droughts that are becoming inevitable and knocking the Bulls from games. From there it becomes about fighting back into the game. And the Bulls with don’t have enough offense to do so with all the injuries and they began to wear down. The defense mostly remained stout, but Howard began to get loose off the weak side for lobs and rolls, the kind of game the Lakers envisioned when they traded for him. No one knows the fate o Howard and the Lakers, but he seems grudgingly to finally have accepted the notion he’s not going to be a post up favorite with Bryant and Nash and better attack from the weak side of he wants to score. He is, and the poor shooting Bulls didn’t have enough to hold he and the Lakers off with a 39.1 percent shooting fourth quarter. The Bulls weren’t that interesting, though the Lakers, of course, were as Ron Artest late in the first half apparently objected to Bryant missing a screen he was setting and Bryant upset Artest got the offensive foul call with the Lakers taking a 44-38 lead. Bryant and Artest yelled at one another and Artest who was sideways already at zero for five on threes did refrain from drawing his 12th league suspension. How could Howard not want to stay with those wacky guys? “I will give them credit,” said Deng, who perhaps has suffered the most with the lack of continuity and consistency in the Bulls’ offense as he’s now shooting 30 percent on threes for the season and 42 percent overall. “They played well. Their defense was solid. We never make any excuses. We’re just being a team with the guys we have. We have enough to win. We could play a lot better. We’ve played better before. Just on both ends of the floor we could do a lot better.